Despite being surrounded by the US Presidential Elections controversy, Facebook continues to bring in profits for its shareholders. 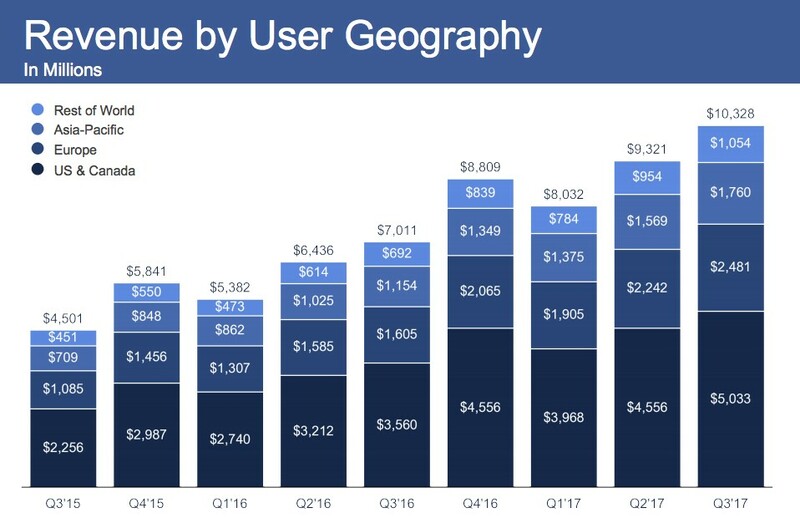 Quarterly earnings report for Q3 was released by Facebook recently and the results were way higher than what Wall Street had anticipated. The current earnings shattered all previous records and hit an all-time high. $10.33 billion in Revenue. Wall Street expected it to be $9.84 billion. Went up 47% compared to the same time period last year. Earnings per Share (EPS) (GAAP): $1.59 up from expected $1.28, an increase of 77% from last year. Monthly active users: 2.07 billion, up from 2.01 billion last quarter. Daily active users: 1.37 billion, up from 1.32 billion last quarter. Net income this year: $4.7 billion, it was $2.63 billion last year. Ad sales from phones contributed to 88% of the total sales. Total ad sales accounted for $10.1 billion out of which $8.9 billion was brought in by mobile phone ads alone. With the increased number of daily and monthly active users, the prices of ads also went up by 35%. Ad prices will continue to rise as Facebook keeps on getting more users. During a conference call, Chief Operating Officer Facebook Sheryl Sandberg told that Facebook now has over 6 million advertisers while Instagram, which Facebook acquired in 2012, has 2 million different advertisers. Mark Zuckerberg, CEO Facebook, told that Facebook is fighting hard against fake news. He further added that though the profits have increased, they will take a hit as Facebook is aiming to invest more in its fight against fake news spread through the platform. “Protecting our community is more important than maximizing our profits,” Mark Zuckerberg said as he addressed the conference. Facebook is expected to increase its spending by 45-60% during the next year to combat fake news, CFO Dave Wehner told. Facebook is also working on video sales, as the ads through newsfeed are reaching their limit. Facebook’s stats revealed that there are roughly 10% duplicate accounts on the social networking site, a number that increased by 4% during the past year. This isn’t a great news for the investors as Facebook has aimed to pour-in more money to fight the fake news issue. Facebook’s lawyer Colin Stretch informed the media that the company aims to hire 10,000 people to eliminate the spread of misinformation and other related issues. Facebook has already hired 2500 employees during the past quarter. Colin Stretch is currently appearing before House Intelligence Committee hearing about Russian election interference and the role of Facebook in it. Facebook is facing a backlash from US Senate for its negative role in 2016 US Presidential Elections. It was revealed by Facebook that unverified and made-up news reached almost 122 million users during the elections. Facebook has made efforts in the past to combat the spread of fake news. Facebook’s Q3 report is an evidence of social networking giant’s money-making power.